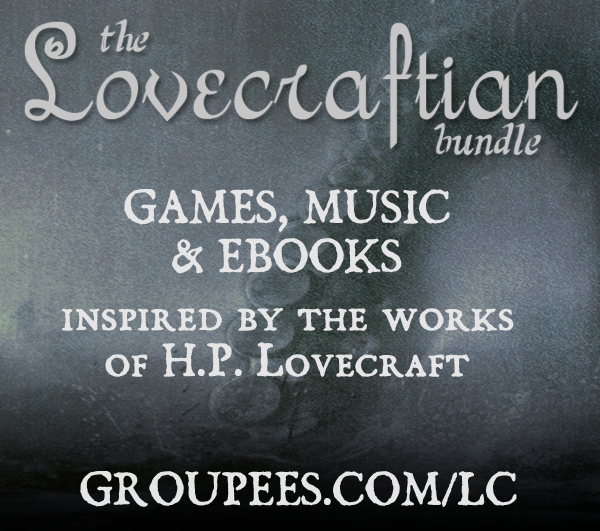 It’s a 2-week Pay What You Want ($1 minimum) sale featuring 4 video games, 5 albums, ebooks and more, all inspired by the works of HPL. Customers can choose for part of their contribution to be donated to Freedom For Jen, to help a woman living with Muscular Dystrophy get a ramp so she can drive. And it’s an easy way for you to get our album “The Fourth” for just 1$ – but of course you’re encouraged to pay a little more. The 3 top contributors even get a physical copy of “Ether” for free! So hop over to https://groupees.com/lc and check it out – it’ll be there for 2 weeks only! Previous post: New album “Ether” out now! (*) And with that, I mean real FLACs, not just re-encoded lossy files like Groupees does for some of their FLACs. While the 13th track is really empty, we release two additional tracks as downloads simply because the CD was completely full. This was some time ago and these tracks didn’t make it on this website yet. I’m going to upload them this weekend and all people can download them for free! I don’t know if Groupee did some re-encoding since they got all files from us, incl. MP3, FLAC and uncompressed 16-bit WAV.